Movies with realistic fictional psychopaths - just click on the links below. Best psychopaths in novels plus Reviews and Excerpts. If you would like to contribute or promote your work here then please use the website contact form. Enjoy crime fiction? 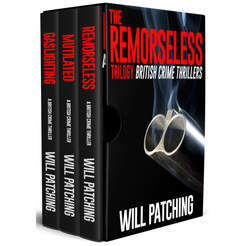 Then read the site author's serial killer thriller, Remorseless. Get inside the mind of a violent psychopath in a novel described by serving Brit detective Scott M as the 'best book' he'd read as it helped him understand his 'clients' better!